The Foce quarter of Genoa is the birthplace of some of Italy’s most legendary figures in music and song: Gino Paoli, Luigi Tenco, and Bruno Lauzi—names that in Italy carry similar weight to George Harrison, Neil Young or Mick Jagger—and Paolo Villaggio, one of Italy’s best-loved actors and famous for his depiction of Ugo Fantozzi in a series of films about a luckless accountant working for an industrial behemoth. Villaggio is a close friend of poet and singer Fabrizio De André, sometimes referred to as “Italy’s Leonard Cohen” and also from Genoa. 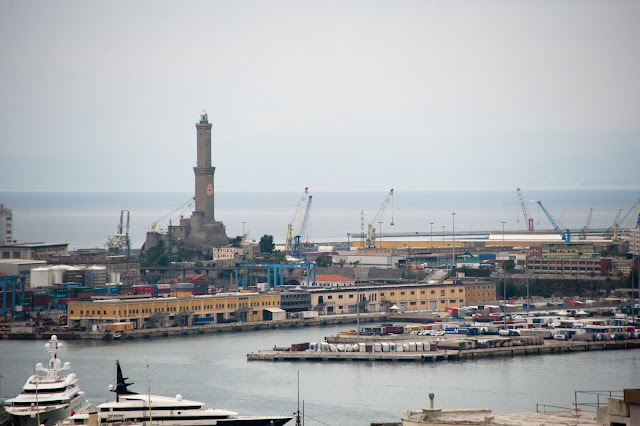 Genoa’s history begins 2600 years ago when, according to legend, the city was founded by the two-faced god Janus, guardian of gates and doors. Genoa has always been a “door” between civilisations, a cultural meeting point between the Mediterranean and Europe. But the city really started to make its mark in around the year 1000, when it became a republic and conquered military and mercantile control of much of the Mediterranean. The apex of its power came with Admiral Andrea Doria, who made the title of “Republic of Genoa” official and thanks to whom Genoa became home to rich merchants, expert navigators, and financiers of the powerful Spanish empire of Charles V.
You can relive the splendours of Genoa’s past by walking down the central via Garibaldi, which at various times in history has been called Strada Maggiore, Strada Nuova, and via Aurea. Here in just 250 metres there are 14 buildings of exceptional beauty, built between 1550 and 1716: this is the treasure chest of the Ligurian capital, which at night shines like a sunlit diamond. These buildings are some of the 42 Palazzi dei Rolli (literally, “Houses of the Rolls”) which were collectively declared a UNESCO World Heritage site in 2006. They were private residences which the Genoese nobility were required to make available to the Republic to accommodate visiting kings, princes or high prelates. They were, in other words, the forerunners of today’s 5-star hotels. Fine examples include Palazzo Tursi, today the municipal seat, and Palazzo Rosso and Palazzo Bianco (their names translate to Red and White Palace, respectively), today the Museums of Strada Nuova. The painter Pieter Paul Rubens visited Genoa many times in the early 17th century and he wrote a book about these buildings in which he described their architectural styles. This book would later inspire the wealthy classes of Antwerp, Rubens’s city of origin. Some of his paintings are preserved in the Church of Jesus in Piazza Matteotti. Staying on via Garibaldi, at no. 14 there is Palazzo Podestà, with its facade so richly decorated with gargoyles and garlands and, at no. 3, the similarly beautiful Palazzo Lercari Parodi, today an auction house. Via Garibaldi leads on to piazza Fontane Marose, with its neoclassical Palazzo Pallavicino and the splendid Palazzo Spinola which alternates white marble with black slate, a local stone much used in Liguria. Turning onto the elegant via XXV Aprile brings us to piazza De Ferrari, Genoa’s main square, which is overlooked by the Palazzo Ducale, historic seat of the Doges of the Republic and today the venue for exhibitions and cultural events. This palace has a medieval heart, which today can only be seen in the stone Grimaldina tower. The central body of the palace with its two colonnades was built between the 16th century and the early 17th century, and was later reconstructed in the 18th century following an extensive fire. In 1992 the area of the old harbour, which in the past was merely an area for loading and unloading goods, was “given back” to the Genoese via a monumental redevelopment project designed by one of the most famous architects in the world (and, coincidentally, Genoese), Renzo Piano. Here also is the city’s aquarium, which contains one of the biggest collections of biodiversity and ecosystems in Europe, with seals, sharks, dolphins, penguins, piranhas, rays and many, many other species. The interiors were designed by US architect Peter Chermayeff and the intended effect is to make the visitor feel as if they were underwater. When you’re ready to take a break, in the steep, narrow alleys called caruggi you can always find a good focacceria where you can try Genoa’s most famous speciality (classic focaccia and also farinata, made with chickpea flour). If you’re only interested in the sea, the best way to enjoy it is to walk the shore path (Corso Italia) until you get to the sea village of Boccadasse, a jewel of a place where you can still see traditional Ligurian pastel-coloured painted houses. Genoa’s old town centre features tall and very closely-packed houses, creating narrow alleyways which are known locally as caruggi. Here you can still find little shops and artisan workshops which give the centre of Genoa that atmosphere of an old and convivial town. Wandering around these old streets is therefore a must, in Sottoripa or in via dei Macelli for example, where you’ll find places selling tripe, poultry and cod, or in via San Luca e Luccoli, where you can buy clothes and household goods. And there are designer shops too, mainly in via Roma.